"41UR315, 2003.08.1263" by Timothy K. Perttula and Robert Z. Selden Jr.
DECORATION (INCLUDING MOTIF AND ELEMENTS WHEN APPARENT): The vessel rim panel has an engraved scroll and circle motif repeated an unknown number of times around the vessel. The central circle has a smaller circle within it that has pendant triangles (or sun rays). The upper and lower scroll fill zones have curvilinear lines, semi-circles, or sets of vertical engraved lines. Ripley Engraved, var. 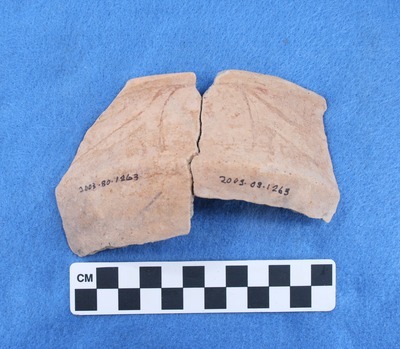 Galt carinated bowl rim sherds, Vessel No. 2003.08.1263.